The extension at here is the famous nineteen point trick play (also known as the "eighteen and a half point trick play"). 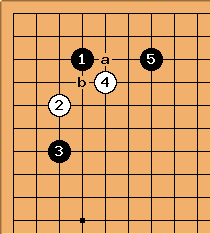 Typical continuations for this joseki would be at a or b: see 3-4 point low approach one-space low pincer press. If White falls into this trick play, Black will give up nineteen points in the corner (hence the name "nineteen point trick play") but get a huge advantage anyway. Read on! and : she is taken in by this trick play. 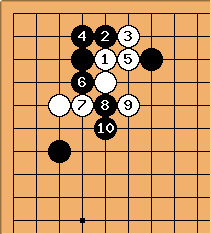 White happily captures the corner, blissfully unaware that Black is intending to sacrifice the corner. Tas: Is w3 the best? It seems to me that a would remove a black liberty to avoid black getting b in sente later, And white b would threaten to break the wall. Tas: With this 5 black won't get both 8 and a in sente. Herman: With this 5, black will play 6 at b and capture the white stones along the top edge. What happens after this ( on )? This seems even worse for white I think. Although the black wall is less perfect, white is running on the second line. Or am I missing something obvious? shmolex: what happens if white instead connects on the first line with 2? It seems like black doesn't get the wall anymore. 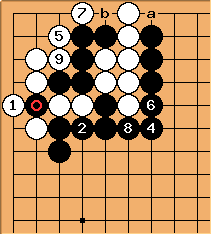 Mef: If I'm reading correctly, instead of playing , black will go for the net immediately, white can only escape by giving black the corner. shmolex: ah, I see it now. Thanks. White can play at to break this trick play. Black must defend at and attacks . The result is favourable for White. The three white stones around form a big bulge. 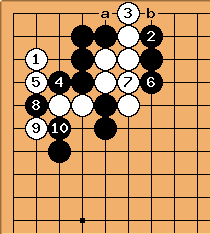 Alternatively, White can choose to play at and in this diagram. The effect is similar. See also topic:1097 for more discussion on this trick play, as well as a tewari analysis of it. Another tewari analysis of this trick play can be found at Tewari Example 8.